AFR Tamarind BBQ, Roasted Brussel Sprouts and our move to SEATTLE! This is definitely one of my favorite dishes from Appetite for Reduction. 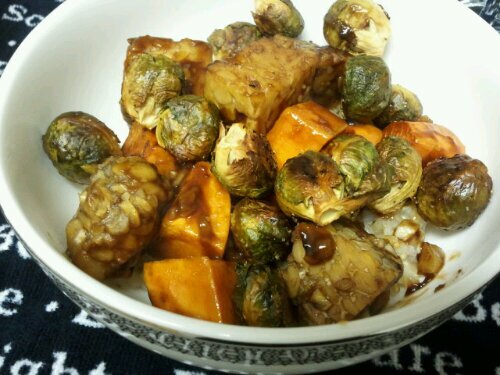 I served it over some brown rice, and tossed in some roasted brussel sprouts for an awesome, easy meal that all cooks at the same time! The rice cooks while the other two bake up together. I just swapped their positions halfway to ensure even baking. The full recipe for the sprouts is in my recipe tab at the top of the page, but I’ll post the simple version here for you too. This lovely, warm, comforting meal was just SO good! 1. Pre-heat oven according to directions for AFR dish, and prepare a cookie sheet. 2. Wash sprouts and trim off the brown ends. Remove any yellow or unappealing looking leaves, and cut in half if medium to large in size. Little ones are fine left whole. 2. Place sprouts in a bowl and spray or drizzle with olive oil. Sprinkle with salt and pepper and toss with hands to coat. 3. Bake right along with tempeh. Don’t forget to switch the positions of the trays halfway! They should be nicely browned and just starting to blacken on top; this is the where the toasty sweet flavor comes from, but keep an eye on them so they don’t burn up! Good luck with the move! Sounds like a busy month, but all of the stops on your journey there should be very exciting! That’s also one of my favorite AFR recipes too! Thanks so much! It should be an amazing trip!